Stille Lyd means ‘Quiet Sound’. This work was entirely developed from sounds recorded within the NOTAM centre itself. 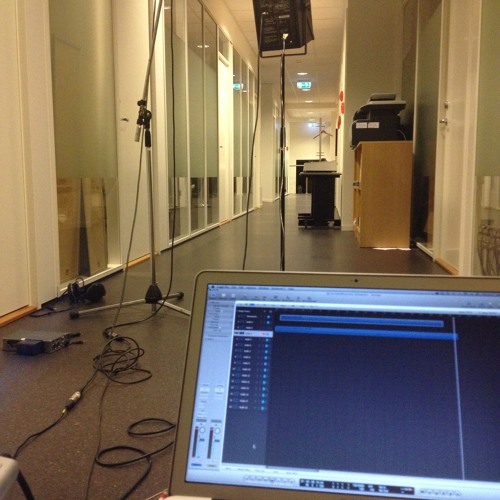 The majority of the recordings were made in the last few days before Christmas 2013, when the building was empty and when it was “quiet”. These ambiences and close recorded sounds were then layered montaged and edited to explore their texture and detail. Snippets of sound emanating from the studio are combined with the drones of the ventilation and the resonant tone of the corridor to develop a piece that explores the sounds of NOTAM. ------ The final version of my first composition developed as part of my AIDF commission working at NOTAM in Oslo. This work has been developed from recordings of the studio and centre itself. I wanted to explore changes in sonic texture and the use of subtle sounds in composition. Quiet sounds are used both in their natural state (presented quietly within the piece), but are also amplified through recording technology, bringing these quiet and often overlooked sounds to the fore, and to the attention of listeners.